Luther Country in Germany, a region named this for its many connections to the Reformer Martin Luther, encompasses numerous towns and cities in Hessen, Thuringia, Saxony and Saxony-Anhalt. These German states are welcoming thousands of visitors and numerous tour groups during the Luther Decade—10 years leading up to the 500th anniversary of the Reformation, a world-changing religious upheaval sparked by Luther in 1517. Special conferences and church services, anniversary events and museum exhibits beckon tour groups to discover how the Reformation changed the world. Faith-based groups, association members who enjoy and cultivate church art, and tour groups of all kinds from throughout the world will be descending on this region to discover Luther’s legacy. Eight designated Routes to Luther have highlighted the various stages of Luther’s life in Germany and show various perspectives of his challenges and accomplishments. These routes feature 36 authentic Luther sites in the region, each offering a better understanding of the life and legacy of the great reformer, his triumphs and setbacks, and highlighting his adversaries and allies. The routes bring to light the era in which Luther lived and how the cultural landscapes of the 16th century in Germany impacted Luther’s thoughts and actions. The routes also offer important insights into those closely associated with Luther, such as Philip Melanchthon, who was author of the Augsburg Confession in 1530, and the famous painter Lucas Cranach, one of the most important artists of 16th century German art. 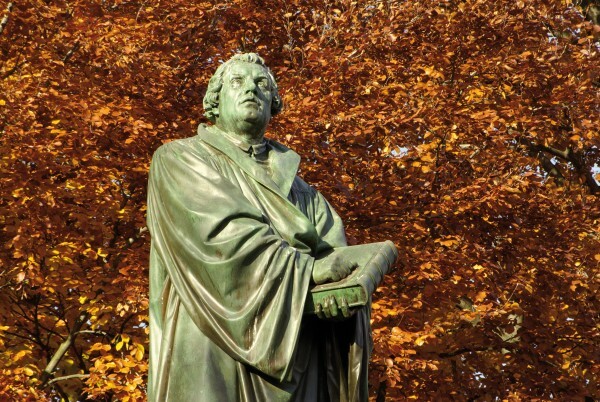 While the routes offer touring groups the opportunity to learn about Luther and his life, as well as illuminating insights into culture and history, they also offer the chance to enjoy Germany’s unsurpassed scenery and genial hospitality. The first route is from Berlin to Magdeburg. A national exhibition, The Luther Effect: 500 Years since the Reformation, is scheduled in Berlin from April 12-November 5, 2017. Berlin’s cathedral, the largest church in the capital city, and St. Nicholas Church in nearby Potsdam are two outstanding points of religious interest. At Lutherstadt Wittenberg, now named “The Town of Luther,” the castle church is where the Reformation began in 1517, when Luther nailed 95 theses to the church door. Luther also taught at Wittenberg University. Luther was born and died in Eisleben, and today his birth home is a museum, which has been open to the public as far back as 1693. The Luther route between Berlin and Frankfurt includes Torgau, where Luther’s wife Katharina is buried. On this same route is Mansfeld, Luther’s childhood home, where archeologists have discovered numerous objects from Luther’s family, including belt buckles and belt decorations, pieces of pottery and even marbles that Luther might have played with as a child. Further on the route is Erfurt, where Luther lived as a monk for six years at the Augustinian monastery. A walking tour of the Medieval Old Town follows in the footsteps of Luther. You can also tour the city in the evening by torchlight or take a guided tour of the historical University quarter. 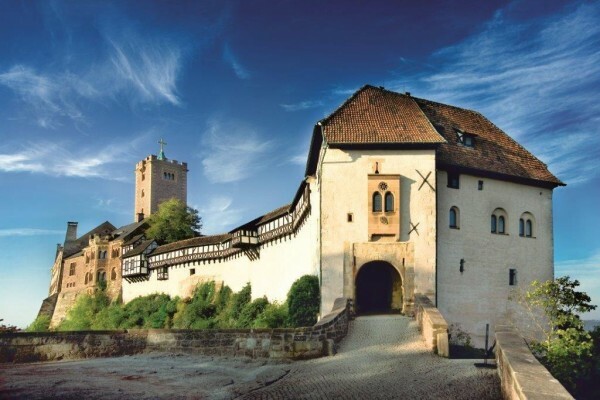 At Eisenach, the 1,000-year-old UNESCO World Heritage site of beautiful 1607 Wartburg Castle, where Luther translated the New Testament, stands tall on a large hill and is surrounded by a dense green forest. A third route, between Eisenach and Altenburg, features the Luther family home at the small town of Möhra, Luther’s first and possibly last documented stay in Gotha, and also Weimar in Thuringia, where Luther often preached in the castle church and in the city church of Saint Peter and Paul, known today as the Herder’s Church. The route between Leipzig and Dresden highlights the region where Luther fought many of his important battles as a monk, including the Leipzig Disputation of 1519. Many years later Luther preached in Leipzig at the famous St. Thomas Church. On this same route lies Torgau, the political center of the Reformation, where the first, new Protestant church was established. In Dresden stands the Church of Our Lady, the largest Protestant domed structure in Europe, and completely rebuilt after the war. It’s said that the church translates Luther’s convictions into stone; a large statue of Luther stands in the square in front of the church. Numerous concerts and musical events take place in the church every year, and from the top dome visitors have spectacular views over the city. 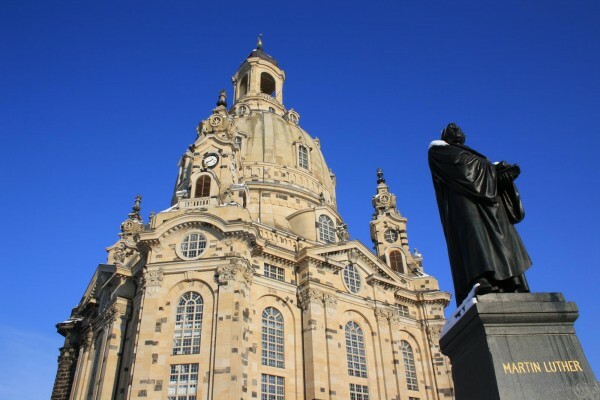 The Frauenkirche in Dresden is the best known symbol of Protestantism in Germany. On the route between Frankfurt and Berlin, groups can visit Worms where Luther defended his 95 theses in 1521, or Speyer where important imperial diets were convened, and where the largest Romanesque church in the world stands. At Heidelberg, Luther offered his first sermon after publishing his theses. In Augsburg Luther also defended his theses, Nuremberg became the first free imperial city to introduce the reformation, and Coburg is important because Luther lived there for a short time. In Halle, Luther’s death mask and a cast of his hands are displayed. A sixth route, also from Frankfurt to Berlin and located in the states of Hessen, Saxony-Anhalt, Thuringia and Saxony, helps to show how Luther won over cities and regions with his new ideas. Worms was an important location for imperial diets, while the world’s largest Reformation memorial stands in Marburg. In Bad Hersfeld, Luther is known to have preached in the abbey church with its striking church tower. The next route, between Frankfurt and Wittenberg, takes groups to Zwickau where a Lutherkeller is positioned directly beneath the Luther Church. The route continues to Zeitz where Luther gave several important sermons and where an original print of Luther’s theses is on display at St. Michael’s Church. The eighth route, from Frankfurt to Munich, makes stops at places such as Worms, home of the largest Reformation memorial in the world; Heidelberg, where Luther presented his first theological discourse outside of Wittenberg after nailing up his theses; and Augsburg, where the Carmelite abbey was Luther’s home for a time. As a European travel destination, Germany is a great value. It boasts one of the lowest average hotel rates in Europe, and the euro-to-dollar exchange rate is the lowest in 10 years. With more than 380 nonstop flights from the U.S. every week, Germany is easy to reach. And the excellent infrastructure, from high-speed trains to rental cars, buses and domestic flights, makes traveling the country simple and efficient. Germany, moreover, has much more to experience than Luther sights, offering beautiful scenery, romantic castles, charming villages and modern cities brimming with culinary delights and cultural treasures. Please find more information about the travel destination Germany at www.germany.travel. The “Luther 2017” e-brochure, filled with information on special anniversary events and details on the eight inspiring Luther routes, can be downloaded at germany.travel/ebrochures. More tour ideas are available at germany.travel/Luther. Starting in the fall of 2016, original artifacts and works of art related to Luther and the Reformation will be showcased in three U.S. museums. “Here I Stand…” – Luther Exhibitions USA 2016 will be presented at the Minneapolis Institute of Art, October 30, 2016 to January 15, 2017; Morgan Library & Museum in New York City, October 7, 2016 to January 22, 2017; and Pitts Theology Library at Emory University in Atlanta, early October to mid-January 2017.